1/2 cup (1 ½oz/43g) raw cacao nibs or chocolate chips or chopped walnuts. Pre-heat your oven to 350°F (180°C), then line a 9×5 inch loaf tin with parchment paper. Set aside. In a large bowl stir together brown rice flour (or almond flour, coconut flour), baking soda, and cinnamon. In a separate bowl combine the mashed banana, eggs, coconut oil, maple syrup, and vanilla. Fold the wet ingredients into the dry until a batter is formed. Lastly, fold in the chopped cacao (or walnuts, chocolate chips). Transfer the batter to your lined baking tin. 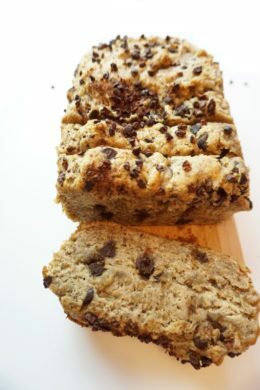 Bake the banana bread for 45-50 minutes or until a toothpick inserted into the center of the bread comes out clean. When the bread is done remove from the oven and allow to cool slightly before removing from the tin. Slice and serve warm or room temperature.